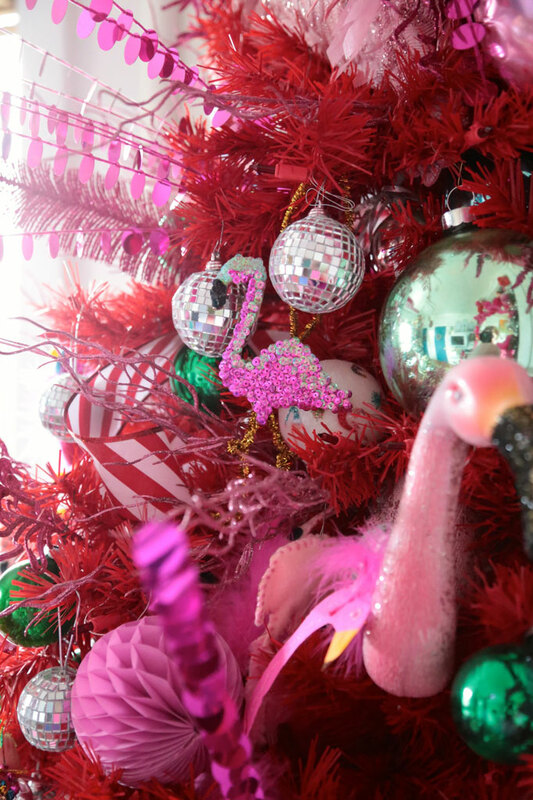 If you have been following this blog for a while, you know I have a thing for flamingos. Christmas flamingos in particular. It might be a pink thing, or a feather thing, but our love grows deeper and stronger every passing year. Last year my collection exploded thanks to The Great Hand-made Flamingo Swap of 2013, but even still, the collection grows a bit every few weeks. 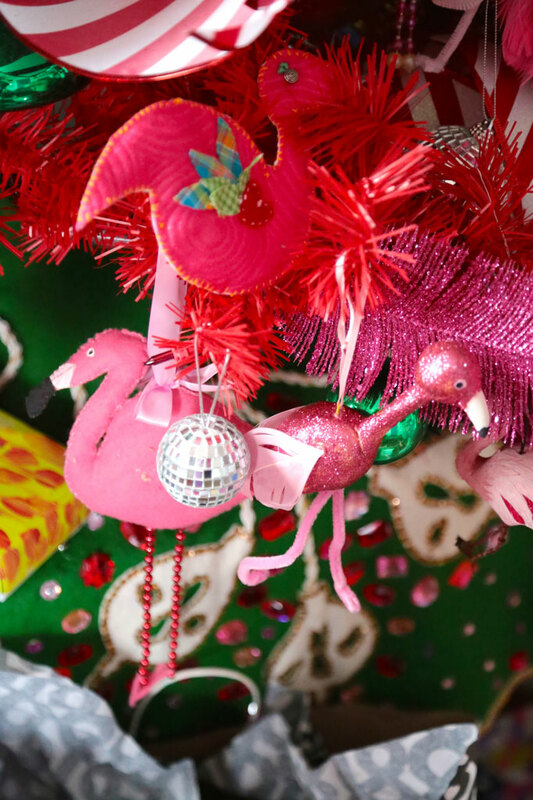 Just yesterday I was in the Christmas market here in DC and found the loveliest hand-pounded tin flamingo from Mexico. Score! I can’t wait to take it back and get it on the tree! 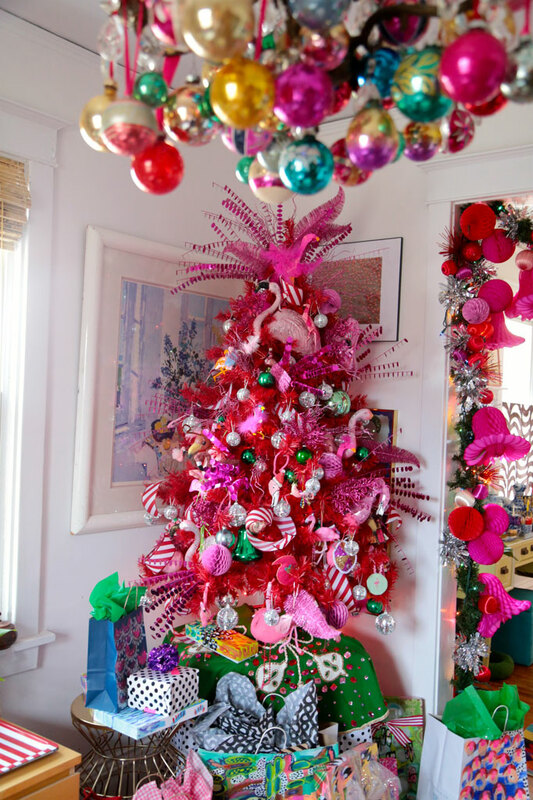 Last year I hung all the flamingos on my pink flocked tree, which is pretty swell, but the flocking fall-out is a major pain. 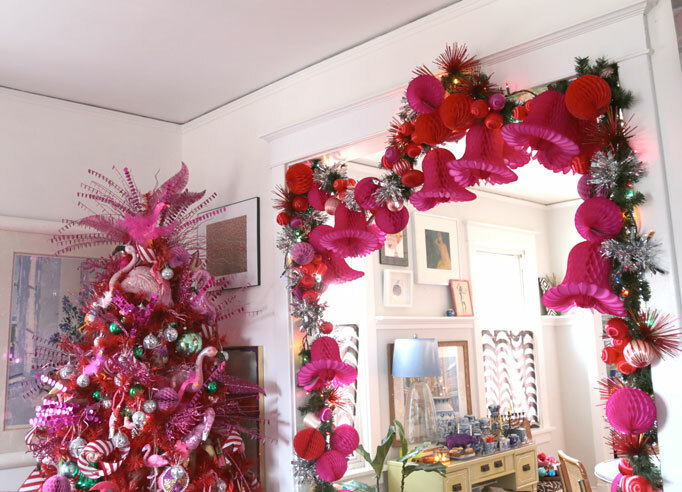 When Treetopia offered to send me their lipstick red tree, I jumped at the chance. Pink and red? Oh hell yes. This is my first tree from Treetopia, though I had read about them from some other bloggers over the years. My experience with faux trees is pretty darn extensive, and honestly, this is a great tree. The lights are strung from trunk to tips in a way that all the branches can easily expand or be fluffed to your heart’s content. My favorite part though, the hallmark of a good tree, is a stomper plug. No bending over behind the tree to plug it in each night — just put your foot on the stomper switch and that’s it. 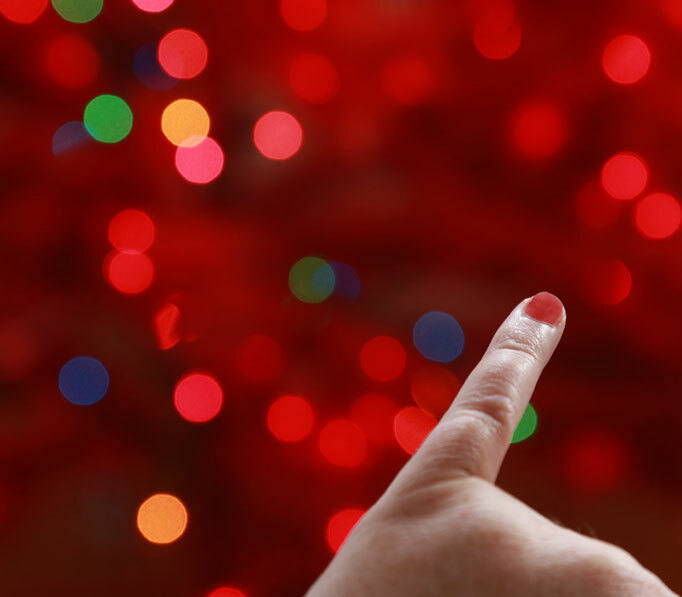 Pardon my weird pinky shot here — I’m trying to throw the lens focus so I can demonstrate how awesome it looks to mix lights. 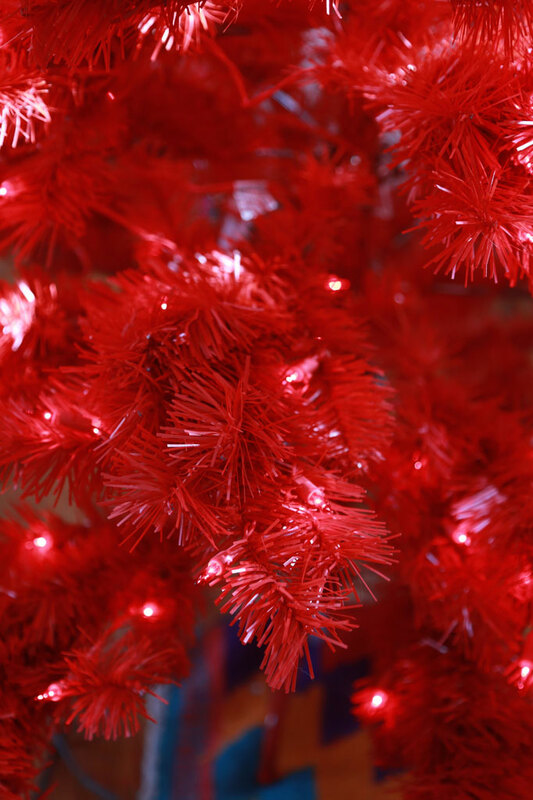 The lights on the tree are red, which, is A LOT to handle. I tempered them a bit with a string of colored lights of my own, but there is no mistaking, this a statement tree. I know there are some people who are WHITE LIGHTS ONLY purists, same with colored lights, but if you ask me, the best lights are mixed. One color strand paired with a rainbow strand is rad. I’m sure someone just read that and is feeling horrified right now, but you know what? It’s Christmas. Variety is the spice of life! Peaches, that room makes me happy. Is it weird that I want to hug the blue chair? I love it so much! I like your decorating. I may have to get a treetopia tree after seeing this. I am really interested in the terrific painting of the redhead near the door frame. Can you tell me who painted it? Thanks. I’m afraid it was a nameless thrift store aquision. Wish I knew more! 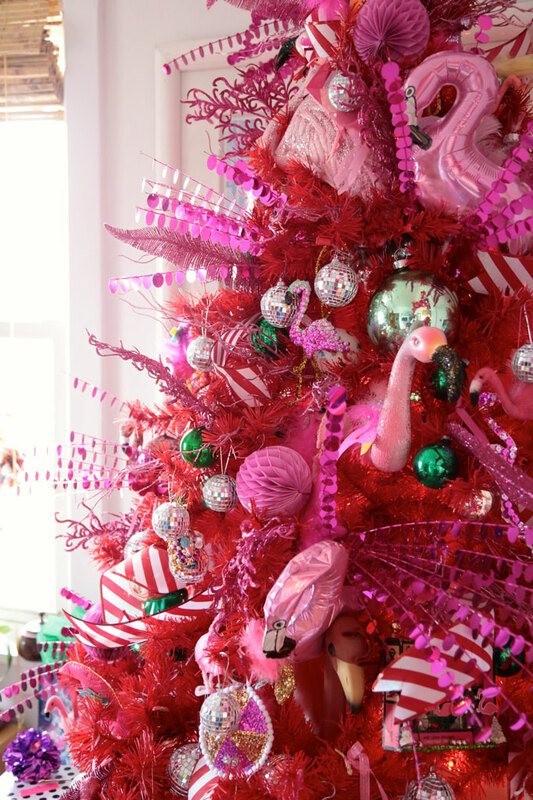 This is awesome, I think I’m definitely going to have to factor in a flamingo themed tree next year! And the decorations are gorgeous. Damn! That is some serious festive biz goin’ on up in there! 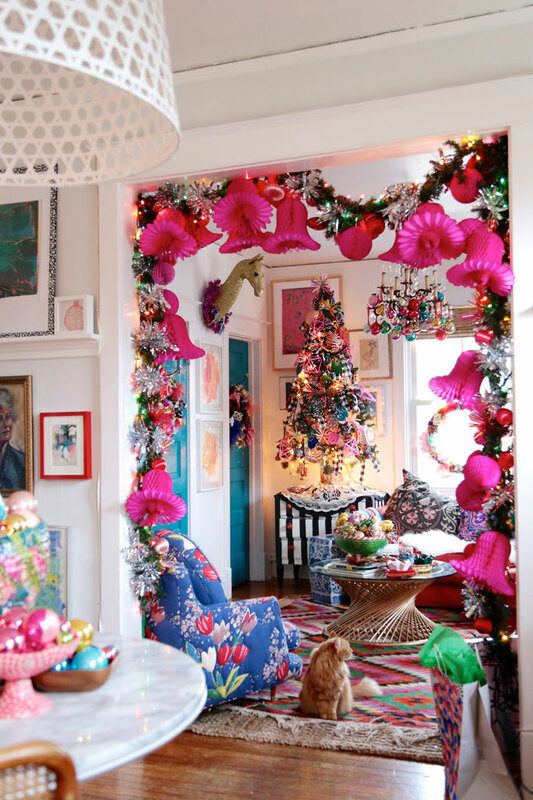 It’s gorgeous and joyful, and I love it! 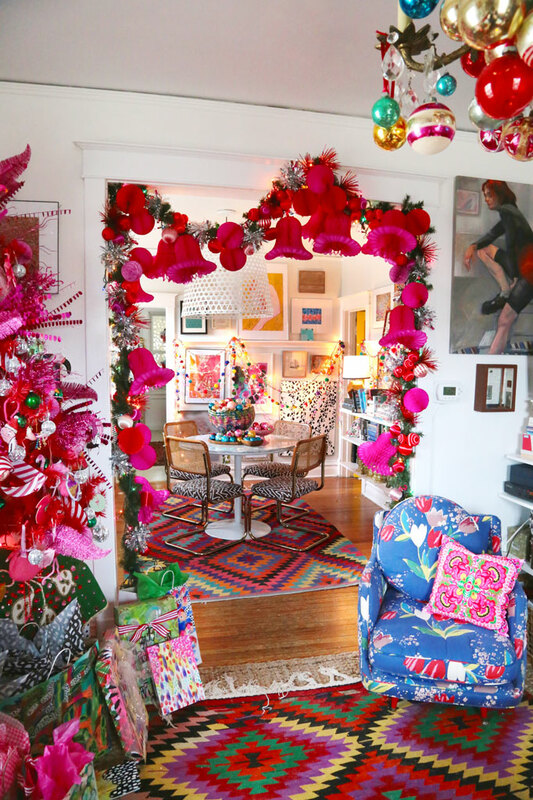 The color explosion you have going on this year is awesome (new pink bells in the archway?) These photos are making my meager little cottage beg for more! This is a thing of beauty! 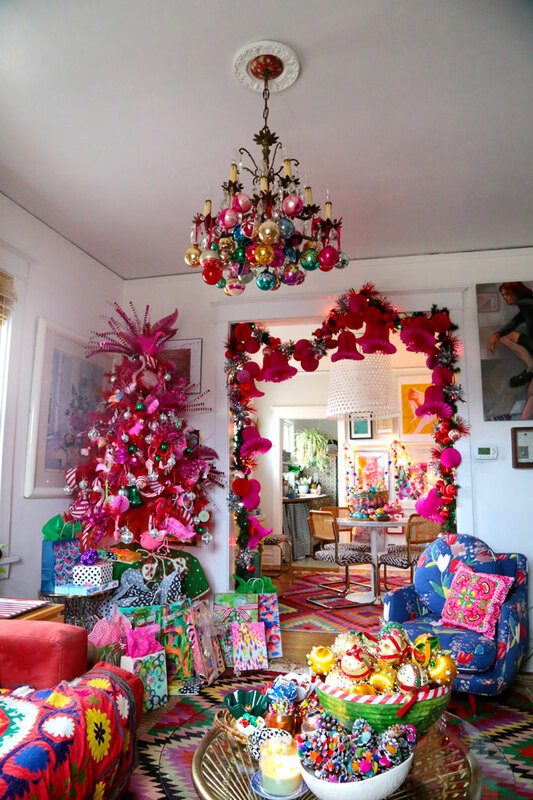 I love your trees and decorations! Our decorations are restrained because of our 15 month old son, but I am living vicariously through your pictures. :-). 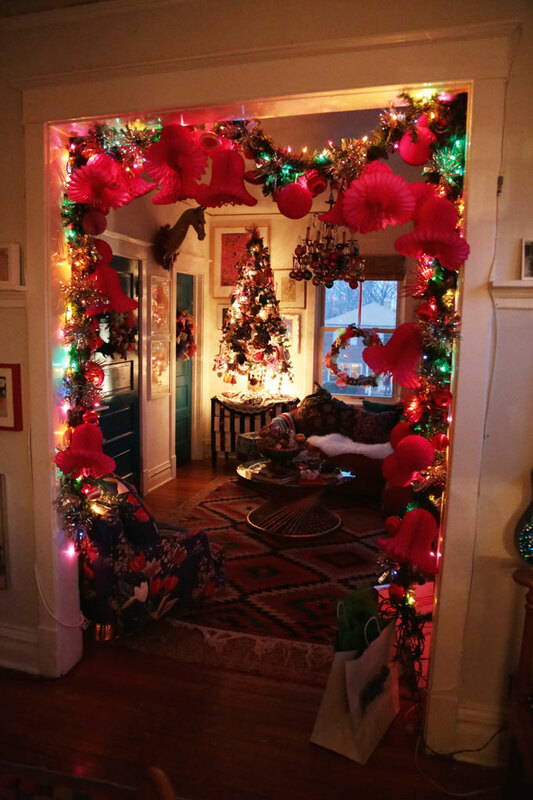 I also really like the chandelier with the ornaments hanging on it. There’s no way he could reach/throw/knock anything all the way up there. I may have to pull out some more ornaments tomorrow . . .
Peaches, i am with you on the lights and colors and rainbows. Christmas is no place for neutrals! Is there really a good time for neutrals anyway? Absolutely spectacular!!! A truly Happy Christmas. there is nothing better than pink and red together!! 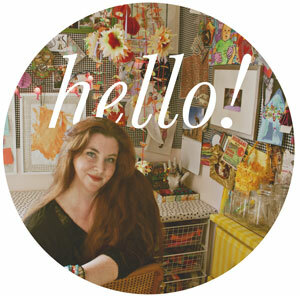 Just catching up on your blog and found this post – is there a how to on the garland somewhere that I missed?!?! 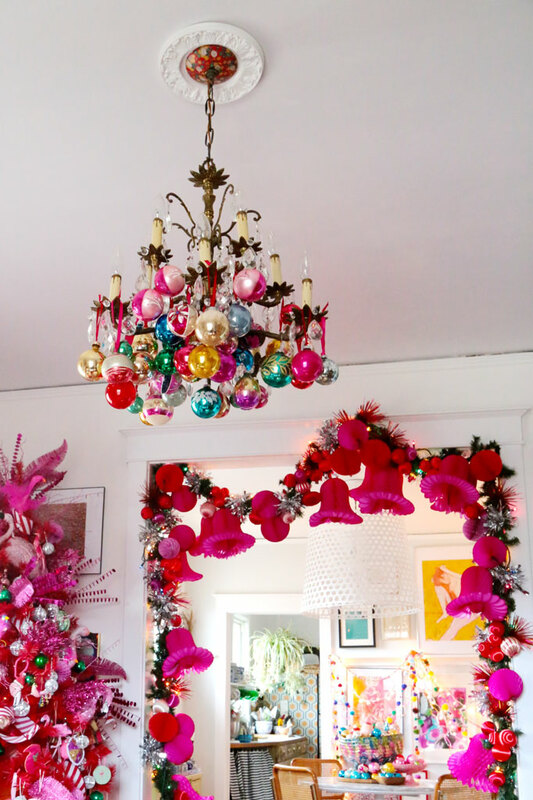 I love the bells and ornaments and lights! 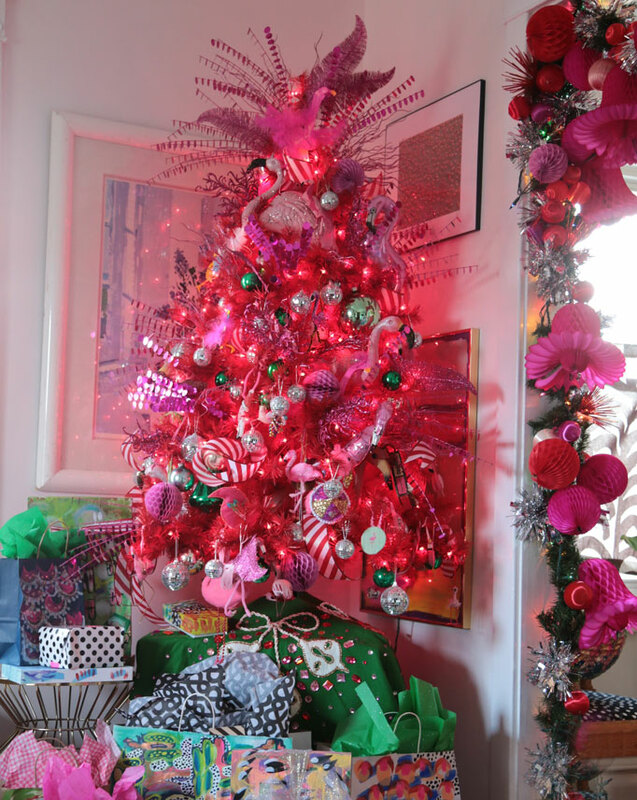 The best part about pink and red is you can leave that tree up until Valentine’s Day! 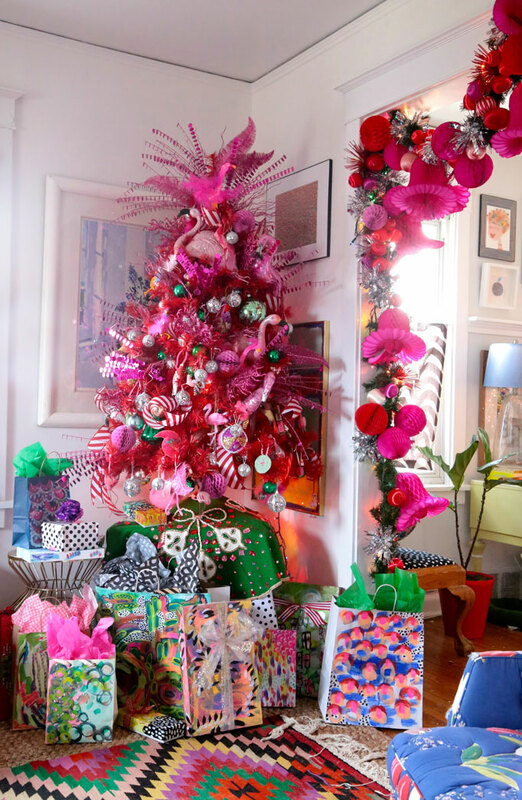 ohmygoodness that tree is ridiculously amazing! 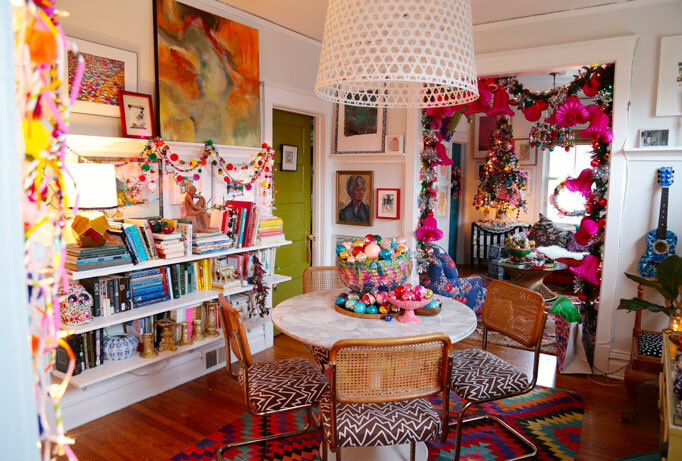 and i love all the color in your house! Your tree is the prettiest tree I have ever seen. I want one just like it. I love pink and almost always wear pink and my hair is usually dyed a soft pink with soft blue ends. I’m a 68 year old kid !!!!!!!!! I wear what I want, and I get so many comments on my pink hair, esp from older folks. And I always get comments on my clothes and shoes everywhere we go. I’m planning on getting my hair dyed again before christmas. Thank you for your beautifully inspiring photos.